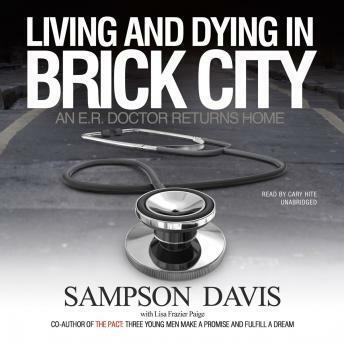 Listen to "Living and Dying in Brick City: An E.R. Doctor Returns Home" on your iOS and Android device. Sampson Davis is best known as one of three friends from inner-city Newark who made a pact in high school to become doctors. Their book The Pact and the work they have done with the Three Doctors Foundation have inspired countless young men and women to strive for goals they otherwise would not have dreamed they could attain. In this book, Dr. Davis looks at the health-care crisis in the inner city from a rare perspective: that of a doctor who works on the front line of emergency medical care in the community where he grew up and as a member of that community who has faced the same challenges as the people he treats every day. He also offers invaluable practical advice for those living in such communities, where conditions like asthma, heart disease, strokes, obesity, and AIDS are disproportionately endemic. Dr. Davis has struggled with many of the issues troubling his patients. His sister, a drug addict, died of AIDS; his brother is now paralyzed and confined to a wheelchair as a result of a bar fight; and he himself did time in juvenile detention-a wake-up call that changed his life. He recounts recognizing a young man with critical gunshot wounds as someone who was arrested with him when he was a teenager during a robbery gone bad, describes a patient with sickle cell anemia whose case is more complicated than he understands, and explains the difficulty he has convincing his landlord and friend, an older woman, to go to the hospital for much-needed treatment. With empathy and hard-earned wisdom, Living and Dying in Brick City presents an urgent picture of medical care in our cities and an important resource guide for anyone at risk, anyone close to those at risk, and anyone who cares about the fate of our cities. The audio was nice to listen to and had good details. I loved the website information given after what he was describing instead of at the end of the book. This was a good book for anyone to listen to.